This excellent 3,000 sq. 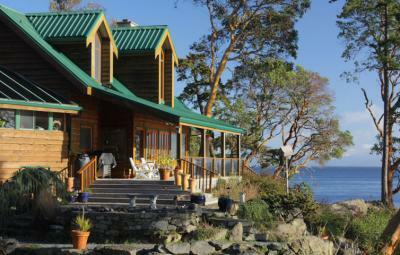 ft. country home presides over 1.5 acres of stunning south-facing waterfront on idyllic Gabriola Island. Located on a peaceful sunny point with only three other neighbours, this incredible property embodies the breathtaking natural beauty and tranquility that the Gulf Islands are famous for. Offering sublime ocean views stretching clear to majestic Mount Baker, this delightful seaside home envelopes you in an ambiance that is both calming, and uplifting. Perfectly suited to the rural surroundings, a carefully edited mix of rustic and West Coast style elements define this welcoming architect designed home. Offering a comfortable and relaxed island lifestyle, casually refined interiors feature wide plank wooden floors, a large stone fireplace with antique oak mantle, vaulted ceilings and a lovely solarium. Quality built, this home includes fine German windows made by Plenk and a very durable raised seam metal roof. Reminiscent of a European farmhouse, the charming country style kitchen offers wooden ceilings, terra cotta tile flooring with hand painted detailing, and a convenient central island with second sink. Enjoy seaside feasts in the bright and spacious dining area where gorgeous ocean views are ushered in through double French doors. Open to the kitchen, this lovely space features vaulted ceilings, a five burner wood stove and a striking stone accent wall. Adding architectural interest, an attractive wooden walkway and mezzanine connects the rooms on the second level while allowing additional light to flood the main floor. Overlooking the living room below, this is a great place for an office or media area. Drink in fresh sea air and be mesmerized by ever changing seascapes...expansive covered decking affords an unfettered experience of this spellbinding coastal setting. Receiving year round sun, this beautifully landscaped gardener�s paradise includes a koi pond, attractive stonework and extensive plantings that blossom in a symphony of colour and scent during spring and summer. In a tranquil scenic setting of forested parks and quiet beaches, Gabriola's residents enjoy a relaxed way of life, mild temperate climate and a strong sense of community. An ideal place for nature lovers, picturesque roads lead to sensational ocean views, sandstone shorelines can be walked almost indefinitely and abundant wildlife includes eagles, heron, seals, sea lions, orcas and grey whales. Come experience the magic of Gabriola Island, and discover for yourself why many who visit this special place decide to stay and call it home.